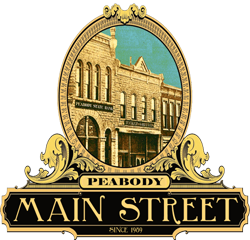 Founded in 1989, the Peabody Main Street Association has been working to revitalize downtown Peabody for more than twenty years. A rare gem, Peabody boasts 42 buildings on the National Register of Historic Places. It looks much today the way it would have looked some 120 years ago. Stunning architecture and friendly faces still grace the Peabody downtown area. If you have never seen it for yourself, you are missing a true midwestern gem!